Feb 10th - A Bit of an experiment! - SolarChat! Feb 10th - A Bit of an experiment! I've been considering a short focal length frac for a while, mostly to get full disk images quickly in poor conditions but also to be able to capture full disk surface and proms that I can overlay. A Bresser AR102xs popped up on ABS for a decent price a couple of weeks back so I went for it. It's focal length meant that I should be able get a solar full disk with my ASI178 in one frame. I've also got half an eye on an upgrade to my H Alpha setup which might include a Quark bolted to a short focus frac, so this fits the bill again. I managed a quick and dirty first light the day after I collected it but the session was rushed due to weather, I struggled to get focus with the Herschel wedge and Ca-K looked poor. Today I had a longer session and managed to get focus with the white light wedge although it's tough to judge results with no detail to be seen! Ca-K still looks quite poor though and I suspect I may be looking at a scope that is not well corrected for spherical aberration? Jury's still out but doesn't look like this is a good scope for Ca-K. Anybody else any experience with short focus fracs in Ca-K? Re: Feb 10th - A Bit of an experiment! Don't have any experience wit this scope. But with a Bresser 127mm f/9,4. Quite good in H-alpha. Not so good in CaK. 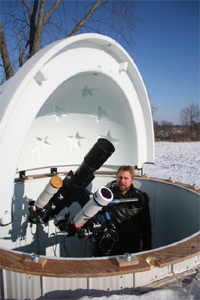 If I ever fall upon a cheap ASI178, I would use it with the lens of a PST CaK. And use the Baader VIP to go from f/10 tot f/12,5. That scope is no good for CaK at full aperture, it is too much aberrated at short wavelengths. Stop it down to 40-50 mm, you should note a marked improvement in definition. Yes, stop to 40-50mm for best results. Thanks all. Definitely worth a try stopping it down at next session. The scope certainly looks good for WL work, and will be interesting to see how it performs stopped down. On the plus side, there are some CaK proms visible so hopefully the scope can made to work. Yup, looking on the laptop screen (was looking on the phone before) that looks like spherical aberration to me!